The numbers in "Tails you win: the science of chance"
Here are brief background notes and links for the numbers used in the "Tails You Win: the Science of Chance"
Warning: as it says in the programme, all probabilities are a matter of judgment. Therefore all the numbers given below are open to dispute, and certainly do not apply to each individual with their unique circumstances. They are intended to represent reasonable betting odds given the limited information provided. 65 Cambridge Graduates have won Nobel prizes. They were students between around 1861 (Rayleigh) and 1972 (Tsien), say 100 years. Now, in each current year around 6500 new students are admitted (around 50% undergraduates). 100 years ago, it was around half that. So say there have been 320,000 new students over the 100 years. The proportion who won Nobel prizes is 65/320,000 = 0.02%, or 1 in 5,000. Of course we have to assume this past rate represents future probability, but I have no reason to believe to the contrary. Degree completion in Cambridge is 99% , the highest in the country. In 2010, out of a population of 55,000,000 in England Wales, 17,201 died of accidents and violence, known as External causes of morbidity and mortality. So that is 17,201 /55 = 313 micromorts a year, or around 1 a day. From Mary Lou Zoback. See the US Geological Survey's excellent earthquake information, including risk maps. I need two 1’s to get a total of 2, with probability 1/6 x 1/6 = 1/36. But there are six ways to get a 7, and so the probability is 6/36 = 1/6. A US roulette table has 2 zeros. So if I place $1 on a single number, there is one way to win and 37 ways to lose (35 other numbers and 2 zeros), all equally likely. If I place $1 on two adjacent numbers, there are 2 ways to win and 36 to lose. If I place $1 on three adjacent numbers, there are 3 ways to win and 35 to lose, which is 35/3 = 11 2/3 to 1 against. If I place $1 on, say red,, there are 18 ways to win and 20 to lose, which is 20/18 = 10/9 = 1.11 to 1 against. This actuarial assessment takes into account assumed improvements in survival over the next 60 years. 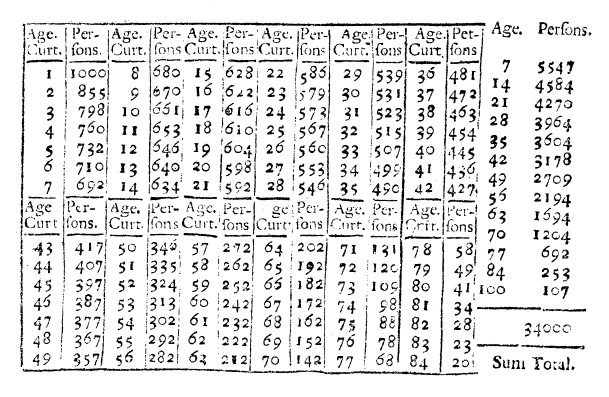 Life tables that do this are known as ‘cohort’ life-tables and come in different versions depending on whether a low, principle or high projection are made. The various statements about “expecting to lose ½ an hour” are based on the following procedure (see our Microlives page for a full description). Calculate the ratio (change in life-expectancy)/(number of days post 35 years old) obtain a pro-rata loss/gain associated with each day with a habit or behaviour post 35 years old. An annual excess risk of around 9% (hazard ratio 1.09) translates to an approximate loss of ½ an hour each day past 35. Of course we cannot know or measure the precise effect of, say, smoking 2 cigarettes – the “1/2 hour” is a mathematical construct that averages over populations and lifetimes. We also cannot conclude that changes in behaviour will result in subsequent benefits. A recent meta-analysis based on over 66,000 deaths estimated a hazard ratio of 1.29 for all-cause mortality per 5 kg/sqm increase in body mass index (BMI) over the optimum of 22.5 to 25 kg/sqm. For a man/woman of average height (1.75m/1.62m), this corresponds to a hazard ratio of around 1.09/1.10 per 5 kg overweight. In a recent meta-analysis of studies involving over 1,000,000 subjects and 94,000 deaths, one drink (10g of alcohol) per day was associated with an adjusted hazard ratio of around 0.83 for men. Each successive daily drink was associated with a hazard ratio of around 1.06, up to 6 drinks a day. The protective effect of alcohol on all-cause mortality is controversial due to the possibility of residual confounding and ex-drinkers having stopped due to ill-health: Di Castelnuovo and colleagues consider a cautious hazard ratio for low consumption is 0.9, which we have assumed. This for a man, 3 pints of low-strength beer (3.5%) per day, containing around 6 UK units (48g of alcohol), would be associated with a hazard ratio of around 0.9 x 1.06 x 1.06 x 1.06 x 1.06 = 1.13, corresponding to around ½ hour each day loss in life-expectancy. We assume this regular exercise is on top of being reasonably active. A meta-analysis of 22 studies and over 52,000 deaths estimated an adjusted all-cause hazard ratio of 0.81 for 2.5 hours per week (20 minutes a day) of moderate exercise compared to no activity. There were strong diminishing marginal returns, with 7 hours a week associated with a hazard ratio of 0.76, or 0.76/0.81 = 0.94 when compared to 2.5 hours a week. So the extra ½ hour a day of exercise was associated with slightly less than ½ hour average gain in life expectancy. Also, in a study of over 400,000 people in Taiwan, an extra 15 minutes of activity each day was associated with a hazard reduction of 4%, so ½ hour was associated with a hazard ario of 0.92, corresponding to around ½ hour gain in life-expectancy. These results are for ‘moderate exercise’, and so the ‘run’ is more of the ‘brisk walk’ variety. Doll and Peto estimated a Standardised Mortality Ratio of 2.17 for smoking 15-24 cigarettes per day. If we assume a hazard ratio of 2.2 for 20 cigarettes, and a constant effect of each cigarette on the risk, then pro-rata this translates to a hazard ratio of 1.08 per 2 cigarettes, which translates to 1/2 a day loss of life-expectancy. For smokers, a hazard ratio of 2 is assumed. Downhill skiing in the Alps has an estimated average daily risk of 1.1 micromorts. We assume a long weekend. A US study reports 26 cardiac deaths in 3, 292, 268 marathons. The US Parachuting Association reports 21 deaths in 3,000,000 jumps in 2010.
reports an average of around 10 micromorts a jump for trained parachutists, but only 3 micromorts for a tandem jump (based on 1 fatality in 380,000 jumps). My judgement was around 7. Around 7 miles on a motorbike per micromort in the UK in 2010. Annual hazard from all causes for an 18-year old. At each draw, a number has a 6/49 chance of being picked. The number of times each number occurs after N draws therefore has a Binomial distribution with mean 6/79 N and variance N 6/49 43/49. A normal approximation to this distribution can be applied to the histogram of the counts. “a family having three children all with the same birthday, born in different years, but all their three children being born on the same birthday. Wow what are the chances of that? We assume no family planning, and no February 29th births, and so babies essentially pop out at random, equally likely to be born on one of 365 days. The important thing is that the first birthday is irrelevant - it can be anything. But the next 2 must be on the same day as the first, and this occurs with probability 1/365 x 1/365 = 1 in 135,000. See our web page on this. There are 24,000,000 households in Great Britain, and 1,000,000 of them are made up of a couple and 3 or more dependent children [Social Trends 37, page 14, 2007]. An hour watching TV: LOSE 15 MINUTES OF YOUR LIFE! Based on 1270 deaths, the EPIC Norfolk study reported a hazard ratio of 1.04 per hour of television per day, adjusted for other lifestyle factors including overall activity, corresponding to 1/4 hour off your life-expectancy for each 1 hour watching TV.